My PCR is a coalition of chronic myeloid leukemia (CML) patient advocacy organizations that are: (1) collectively raising awareness about the importance of global access to polymerase chain reaction monitoring (PCR), and (2) encouraging dialogue about PCR testing between patients and their physicians. Empowering patients to play an active role in their treatment means ensuring they have the right information to talk about PCR monitoring with physicians and community members. Chronic myeloid leukemia (CML) is a cancer of the white blood cells that is associated with an abnormal chromosome. A chromosome is an organized structure found inside a cell that contains genetic information known as DNA. The abnormal chromosome is called the Philadelphia chromosome (Ph+). Ph+ CML is caused by BCR-ABL, an abnormal fusion gene that is formed when a piece of chromosome 9 and a piece from chromosome 22 swap places. The abnormal BCR-ABL gene creates a protein called BCR-ABL. The BCR-ABL protein causes changes in cells that lead them to become cancerous. PCR stands for polymerase chain reaction. It is a blood test used to diagnose CML and to measure the response to treatment in patients who are on tyrosine kinase inhibitor (TKI) treatment. 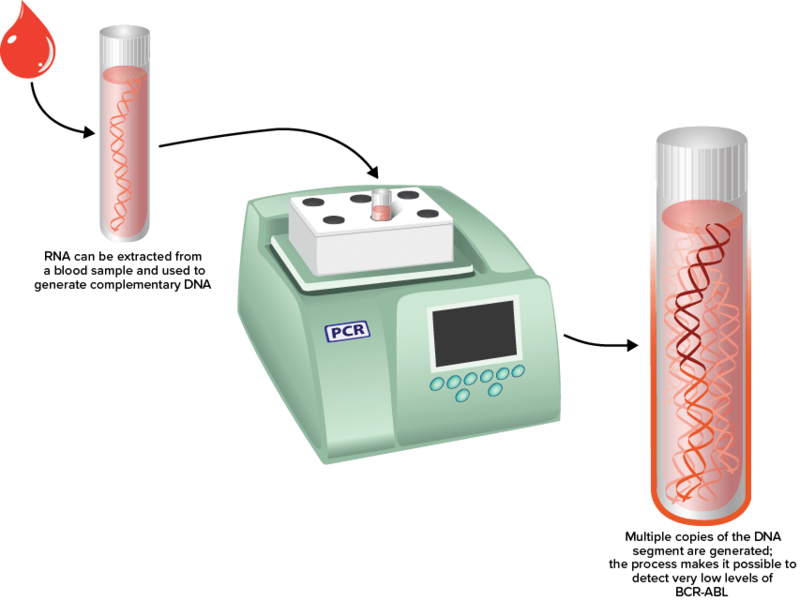 PCR is not only used in CML; it is also used in other conditions and is generally one of the most accurate ways to detect the presence of a substance. For example, PCR testing can detect anthrax on a mailed letter or evidence of a specific virus in a person after bone marrow transplant. Why is PCR testing necessary for patients with CML? diagnose CML by detecting the presence of BCR-ABL. monitor their response to treatment by measuring the prevalence of BCR-ABL. CML usually requires lifelong treatment, so even after a patient’s initial diagnosis, consistent access to PCR testing is critical to monitor their disease. Testing is recommended every 3 to 6 months depending on a patient’s level of response to treatment. By monitoring the level of BCR-ABL over time, a physician can compare results and make informed decisions, like whether or not it is necessary to change treatment to better treat the disease. Other tests are available for patients with CML, such as a bone marrow test. Links to additional resources on bone marrow tests can be found at the end of this toolkit. In partnership with patient advocacy organizations around the world, My PCR works to address these challenges by providing educational information about PCR testing in more than 25 languages, offering grants for partners to raise awareness within their local communities, and supplying informational tools and resources. My PCR is coordinated by The Max Foundation to serve the global community of patient advocacy organizations. My PCR was developed in collaboration with the broader CML community in hopes that all people living with CML around the world will feel part of the initiative. Though it is coordinated by The Max Foundation, My PCR is led by a coalition of Campaign Partners: CML-focused organizations who are raising awareness about the importance of CML treatment monitoring. Any patient advocacy organization that shares this goal is invited to become a Campaign Partner and to encourage discussion around the importance of PCR. The Max Foundation welcomes your feedback on how to improve and strengthen My PCR. Please contact us with your ideas.